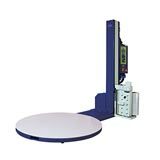 Use Pallet Wrap machines for faster dispatch and professional smooth finish! Available in two types, pre-stretch and semi-automatic options. These cost effective tools will wrap pallets securely, much more faster and safer than manually walking around pallets to secure the load.Stationed in one place, pallets can be transported to the pallet wrap machine, and set to operate with the added benefit of the task being conducted by one operator. Reducing the dedicated manual labour involved with dispatching orders, the pre-stretch pallet wrap machine can stretch film up to 4 times, whilst keeping the same consistency, more than manually wrapping. 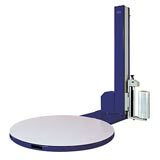 Proving to be not only a cost effective but an efficient tool for any warehouse. With height sensors available on all machines, stretch film waste would be reduced and tension type can be set. View over our pallet wrap machines range today and decide which option works best for business needs. Avoid the repetitive task of manually wrapping pallets, reduce back, wrist or neck injuries by automating the pallet wrapping process. Still undecided about whether or not these machines are an essential tool in your warehouse, why not take advantage of the 7-day trial. With the cost including training, demonstration and delivery, you just need to call our sales team today 01332 821 200 and book your delivery slot.